When the door is closed, most people will have a hard time distinguishing the difference between the TW-101728 (MDF) & the CRP-101728 (MDF) doors. The difference is only slightly noticeable when the doors are opened. In order for Conestoga (CWS) to reduce the cost of their already popular CRP door, they created the TW door, maintains exterior aesthetics, but uses a flat MDF center panel instead of the raised MDF center panel found in CRP door. 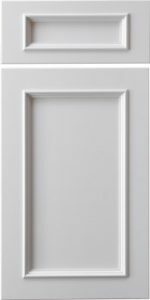 If you decided on the CRP door with a painted finish, but are looking for a way to save a few dollars on your kitchen project, then consider the TW-101728 (MDF) door.